Portable Air Conditioners Provide Air Temperature Control For Applications Including Residential, Office, Commercial And More. 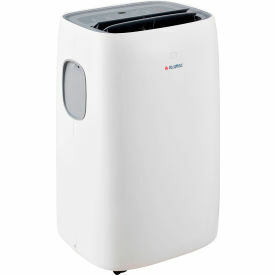 Units allow portable air regulation, reliable cooling and increased comfort for basements, garages, shops and more. Most units Include casters for easy mobility and maneuverability as well as a window exhaust kit. Available BTUs range from 7000 to 14,000. Cooling square feet range from 250 to 700. EER ranges from 8.4 to 14.29. Dimensions vary per model. Portable Air Conditioners With Heat Improve Air Circulation For Poorly Ventilated Areas Including Basements, Offices, Garages And More. 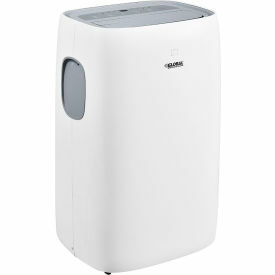 Portable air conditioners can be placed in a poorly ventilated area or easily moved from area to area as needed. Dual-function climate controls are cost effective, and versatile. They also maximize energy efficiency. PVC plastic construction gives you durable dependability. Remote control, digital display and timer controls allow operator control and convenience. Casters give you easy mobility. ETL and UL listed.